Over in America, there seems to be a huge market for films geared towards a more religious audience, with films like God’s Not Dead, War Room and Heaven Is For Real all finding varying degrees of financial success, but very rarely are they considered to be legitimately good movies, with critics going off on their overly biased and even dangerous ideals, likening them to straight up propaganda for the Christian agenda designed only to reaffirm the beliefs of those who have been already converted. It’s rather telling that these types of films are so universally panned that when they make their way over to the UK, they’re either released direct to DVD or buried entirely, with only a small handful actually receiving a theatrical release. 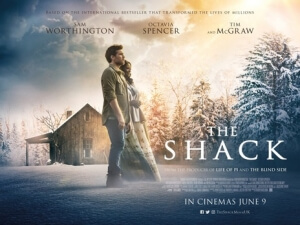 The latest example of the latter is The Shack, a faith-based story based on William P. Young’s bestselling novel, and while it may not be as hateful or as uncomfortably biased as some of those other films, it still manages to undermine its own positive morals with some extremely syrupy symbolism and the pace of an asthmatic ant that’s carrying some heavy shopping. The film is about a man named Mack Phillips (Sam Worthington), who after experiencing an abusive childhood – and is then shown pouring strychnine into his alcoholic father’s bottle, effectively murdering him, but that plot point is NEVER brought up again in the film – raises his own family with love and care. Things change, however, when his youngest daughter is taken and murdered whilst on a family camping trip, and as Mack is in the midst of his grief he receives a note from “Papa”, his wife Nan’s (Radha Mitchell) nickname for God, inviting him up to the shack where his daughter’s bloodied dress was found. Once he gets there, he is surprised to come across three people who claim to be the Holy Trinity – God aka Papa (Octavia Spencer), Jesus (Aviv Alush) and an Asian woman named Sarayu (Sumire) – and basically spends the weekend with them as they teach him how to overcome his grief. The morals behind this story, as bonkers as the ideas of it may initially seem, are fairly decent ones, like the notion of learning to forgive yourself and not to be so judgemental about others, but the execution of these ideas is not just heavy-handed but also about as subtle as a bowling ball to the groin. Director Stuart Hazeldine, the British director behind the 2009 psychological thriller Exam, doesn’t seem to be able to have found a way to translate these morals and the overall impact of this story into a film, making it feel like you’re just watching the audiobook version of the source material than something that’s meant to be entirely different in a visual medium. The film is a lot of people just sitting around talking to each other while occasionally throwing in overly-done symbolic imagery to get their point across, which after a short while makes it extremely tedious and boring to watch – not exactly the best thing when your film is over two hours long – and rather disappointing that nobody is making much effort to tell this story through more of a visual scope. Instead, Hazeldine goes overboard with the religious symbolism and inadvertently makes the good intentions feel particularly heavy-handed. Hazeldine’s clumsy execution also stretches to how his actors perform, as most of them are either emotionless wet blankets or just feel like they’re passing time until a much better project comes along for them. Worthington is especially directionless as he not only has the same blank expressionless face throughout the majority of the film, but his line deliveries are mostly just flat and whispery as though he’s doing a lame impression of Christian Bale’s Batman voice. His accent also tends to slip so much back into his native Australian it often becomes distracting, and he never feels like he’s actually going through this on-screen strife but more as an actor who’s struggling to say these lines with a straightforward American accent. The fact that he’s the main lead of this film makes it particularly painful to watch, and you more often than not pity the actor trying so hard to maintain his accent than you do the grief-stricken character that he’s playing. Worthington is one of those actors who tends to be fairly hit and miss for me, and I’ve seen him be perfectly fine in other things, but this is definitely one of the weaker performances I’ve seen from him, and I’m not sure it’s entirely his fault due to the heavy-handed nature of Hazeldine’s direction. Again, the morals that this film wants to represent, like learning to forgive yourself for past mistakes, letting bygones be bygones etc, are conceptually good morals, and in a much better handled film would probably have gotten through a lot more sufficiently than they did. After all, whether or not you practise religion, it’s good to have a positive view of the world and have some good codes to stick by throughout life, and if you’re just a kind-hearted person that’s all you really need. But films like The Shack are just a little more interested in forcing them down our throats instead of letting them work their way in naturally, and the result is a painfully dull, overly-sentimental and exceptionaly heavy-handed mess. But hey, at least they actually cast a Middle-Eastern guy as Jesus, so… there’s that, I guess. The Shack offers some nice morals, but they get lost in the mix as director Stuart Hazeldine botches the good intentions with some heavy-handed religious symbolism, a pace that’s too slow and boring to really become interested in, and an overly-sentimental tone that holds your hand all the way through.